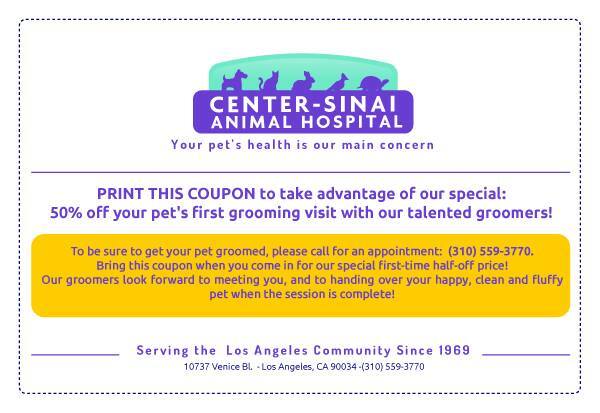 Home » Save Money on Veterinary Bills » Print Coupon for CSAH Pet Grooming Special Discount! Does your furry friend need a bath, a haircut, flea treatment, nail trimming? Take advantage of our ongoing pet grooming special discount – 50% off your pet’s first grooming session with us! Our Center-Sinai Animal Hospital groomers have a magic touch when it comes to helping you get your furry dog or cat even more gorgeous, clean, and flea-free! We also offer our bird parents beak and nail trimming and other avian grooming services for their feathered friends. To take advantage of our pet grooming special discount! To save you time and hassle, you can also set up your appointment using our easy TimeSaver form.